Vigils to mark 100 days since peace activist Norman Kember was kidnapped in Iraq have been held across Britain. 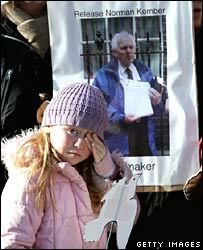 Up to 100 people attended one of the hour-long vigils, in Trafalgar Square, London, for the 74-year-old and three of his fellow captives. Mr Kember, of north-west London, went to Iraq with Canada-based peace group Christian Peacemaker Teams (CPT). "As people of faith we continue to place our trust that they're alive," a CPT member told BBC Radio Five Live. Reverend Alan Betteridge, president of the Baptist Peace Fellowship, who has been a friend of Mr Kember's for more than 40 years, said churches throughout the UK had been asked to open their doors this weekend to allow people to pray for the hostages. "It has been a weekend for prayer but also raising awareness of the situation because there is no news from Baghdad and so it's easy to forget the hostages," he said. The four captives are being held by the Swords of Righteousness Brigade, which is demanding the release of Iraqi prisoners. Mr Kember was last seen alive in a video clip broadcast in January. CPT member Beth Pyles told the BBC: "On a practical level we have the video tape of 28 January that was seen around the world that showed all our guys. "And although they're a lot thinner, they are very much alive, and there's nothing that's happened since January 28th that would lead us to believe there is anything other than life for them." American Tom Fox, 54, and Canadians James Loney, 41, and Harmeet Singh Sooden, 32, were taken hostage with Mr Kember. On release of the January video, The Swords of Righteousness said this was the final opportunity for US and Iraqi authorities to accept its demands. Rev Betteridge said he was hopeful his friend was still alive. He said the feeling among Mr Kember's friends and associates was a mixture of hope that he would soon be released and concern over how he is coping with captivity. "On the one hand you are glad they are still alive but on the other you wonder what is happening to them after 100 days," he said.